Iron Craft is a fun blogging experiment that challenges crafters to create and share a project a week (based on weekly guidelines). As soon as I heard about it, I signed up. This week's challenge didn't have many parameters, "make something to bring some sparkle and light into those long winter nights. Create candle holders, lamp shades, luminaries, anything that will bring on the light!" Inspiration struck when found a bunch of red felt as I was sifting through my craft supplies (I am going to try not to buy any new tools or materials for the challenges). The felt reminded me of the gnome ornaments I made for Christmas, and after some sketching I came up with mushroom night lights. First, I cleaned the jars and removed the labels by soaking them in soapy water. 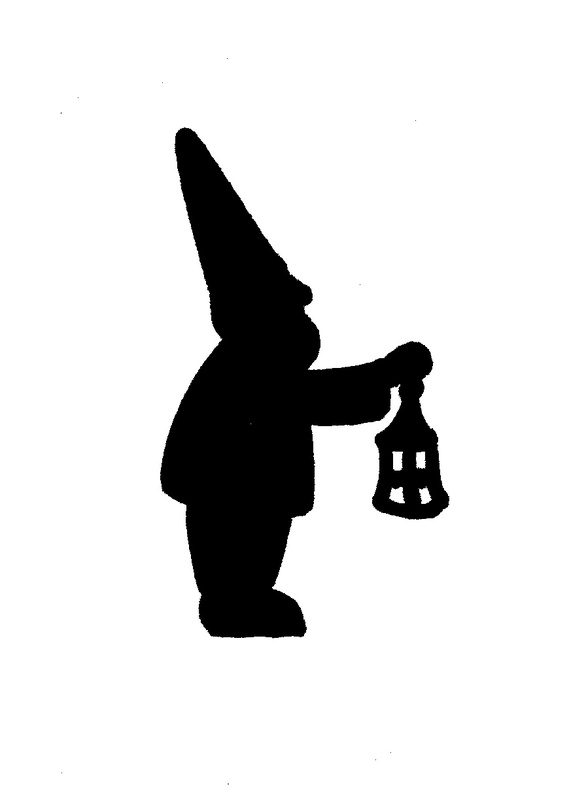 While they dried I drew my little gnome silhouette, scanned it, scaled it down, and printed it on velum. If you like my little gnome feel free to "grab" him. Once the gnome was dry (I have an ink jet printer), I cut the velum to the height of the stage 2 jar and attached it to the jar with double sided tape (gnome feet facing opening of jar so that jar can be placed over the flameless votive candle). To make the mushroom toppers I free-handed and cut an oval out of the red felt (approximately 12" wide by 8" tall). The topper for the small jar was slightly smaller. I used my hole punch to create holes about 3/4" apart around the perimeter of the oval. I then threaded the holes with elastic. I gathered the elastic and tied it. You want it to fit the jar snugly, but not too snugly. If its too tight it will slide and pop off. I shaped the little topper to my liking, then glued on white felt dots. I used a quarter as my template for the dots. To light the little shrooms up I set it the jars over the flameless votive candles. The gnomes have currently taken up residence in my three year-old's room.